NEW ARRIVAL With 60’s D28’s becoming very expensive because of the scarcity of Brazilian Rosewood, 70’s examples are now much more sought after. This is a fine example, it’s 44 years of play have given the guitar a richer, fuller bodied tone than more recent examples. It’s a very versatile guitar, handling all playing styles, from heavy strumming, through flat picking, to delicate fingerstyle. The resonance and sustain are very noticeable, and the tone is superbly balanced. The guitar is in excellent condition, with the obligatory pickguard crack, and comes in it’s original hard case. NEW ARRIVAL If you consider the Martin D28 to be the classic Spruce / Rosewood dreadnought, then the HD28 is a step above this - the Herringbone binding adding a very distinctive touch of class, and the scalopped bracing allowing the top to resonate more. So excellent clarity and definition, with greater attack and sustain. The guitar works well for all styles, from heavy strumming to flatpicking and fingerstyle. At 40 years old, the tone has matured really well, and the guitar is in very good condition, quite faded, and has a very comfortable feeling neck. The guitar comes in a non original hard case. NEW ARRIVAL Martin D28's are know for having a wonderfully rich and resonant tone, so a 12 string version is quite amazing sounding. Hit a G chord and the sound fills the room, ringing beautifully and sustaining for ages. As a dreadnought the bass is full, but this guitar sounds great right across the bandwidth. It has a very comfortable neck, and a very playable action. The guitar is all original and in good condition, with no cracks or repairs, and has an underside pickup installed. It comes in it’s original hard case. NEW ARRIVAL The Martin D35 Jonny Cash commemorative guitar is a very limited edition model - Introduced in 2003 this example is from 2006 and only number 83. 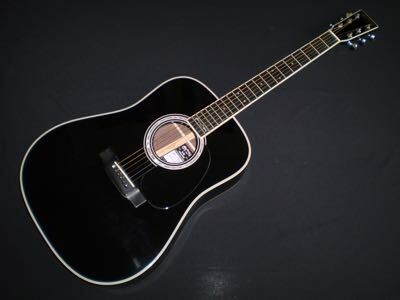 This is an accurate reproduction of perhaps Johnny Cash's favourite guitar - a specially made D35, his and Martin's first guitar with a polished black finish. The attention to detail is really noticeable. An African Ebony bridge and fingerboard, plus a polishd Ebony headplate. Abalone star inlays, a beautiful abalone rosette, and inlayed signature between the 19th and 20th frets. Tonally it's a treat with an Englemann Spruce top with 1/4" forward shifted scalloped braces, which give the guitar a sweet tone with impressive resonance. The back and sides are East Indian Rosewood which add depth and projection. The neck feels very comfortable with easy action making playing the guitar a really enjoyable playing experience. Inside the guitar, the special tribute label has been personally signed by Cash's son, John Carter Cash and Martin chairman C.F.Martin IV. The guitar even comes in a distinctive Geib style black Martin hard case with black hardwear and black lining. 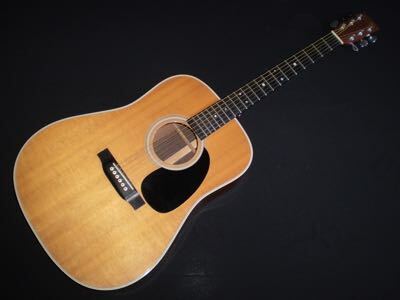 NEW ARRIVAL A lot of people consider the Martin D28 to be the benchmark Spruce / Rosewood dreadnought. Tonally it has a very complex sound, great depth and resonance, plenty of punch and attack, and well balanced with superbly articulated clarity. 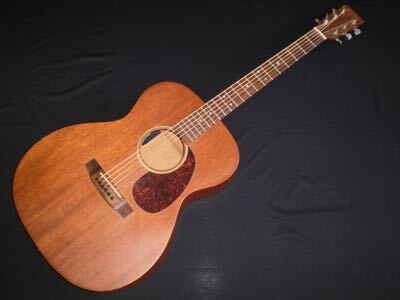 Dreadnoughts are thought to be the most versatile acoustic guitars, and this example sounds great strummed or fingerpicked, with great definition and sustain when soloing. Quite simply it's a classic, and at 16 years old it's starting to mature really well. Visually the Spruce top has turned a warm honey colour, and the Indian Rosewood back and sides are dark and beautifully grained. From a playability point of view, this guitar is a treat, the neck has a great feel to it, and the action is easy. The guitar is in excellent condition with very light playwear, and comes in it’s original Martin embossed hard case. SOLD From Martin's Vintage Series - this is a dreadnought body size 12 fret guitar with a Sitka Spruce top and Mahogany back and sides. It’s scallop braced, with a slot headstock, and features an Ebony fretboard and bridge, plus bone nut and saddle, and Waverley tuners. 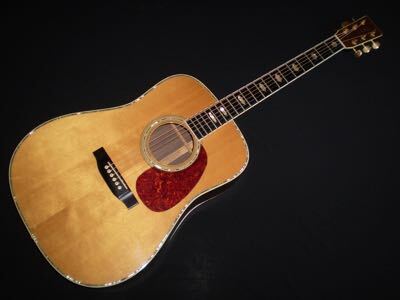 All of these appointments are signs of real quality, and the Martin Vintage Series are very accurate reproductions of their historical predecessors. Tonally it's fantastic, the Mahogany back and sides provide that famous Martin woody tone, and the fact that the body meets the neck at the 12th fret adds a big airy bass response not found in 14-fret dreadnoughts. It’s capable of both bright and punchy tones, yet quite complex and able to handle the most subtle of playing styles. The guitar is in very good condition, with a repaired hairline crack on the lower bout, bass side. It has a K and K pickup installed and comes in it's original deluxe Martin hard case. 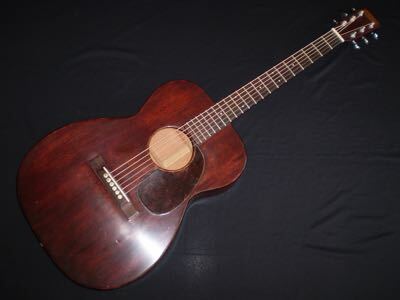 This is an American made, all Mahogany, Martin 000 size guitar in excellent condition. The all Mahogany body gives a rich, warm sound and the 000 size body means the bass and treble response are evenly balanced. Overall the guitar plays very well, looks really distinctive, and is hugely versatile working well for both strumming and fingerstyle. 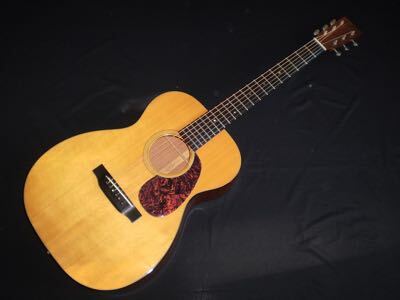 The guitar has a B Band underside pickup fitted with volume and tone controls mounted inside the soundhole, and comes in a non original hard case. ON HOLD From Martin's Vintage Series - this is an 00 size guitar with a Sitka Spruce top and Mahogany back and sides. It’s scallop braced, with tortoiseshell binding, Ebony fretboard and bridge, plus bone nut and saddle, vintage style open-geared tuners, and aged toner on top. All of these appointments are signs of real quality, and the Martin Vintage Series are very accurate reproductions of their historical predecessors. Tonally it's fantastic, the Sitka spruce has a wide tonal range with great projection making it hugely versatile, capable of both bright and punchy tones, yet quite complex and able to handle the most subtle of playing styles. The guitar’s in excellent condition and is a dream to play. It comes in it's original deluxe Martin hard case. SOLD The Martin 000-28 is often described as the ultimate fingerstyle guitar. This example is in excellent condition, the Spruce top has started to mature and turn a beautiful golden colour, the Indian Rosewood back and sides are beautifully figured, and the neck feels very comfortable to play with good playing action. The guitar has no cracks or repairs, with only light playwear that you'd expect from a 13 year old guitar. Tonally it's fantastic, hugely versatile, capable of both bright and punchy tones, yet quite complex and able to handle the most subtle of playing styles. It would make the perfect studio guitar, great for close micing, beautifully balanced with great definition. The guitar has an active under saddle pickup fitted, with tone and volume controls mounted inside the soundhole, and comes in it's original Martin embossed hard case. 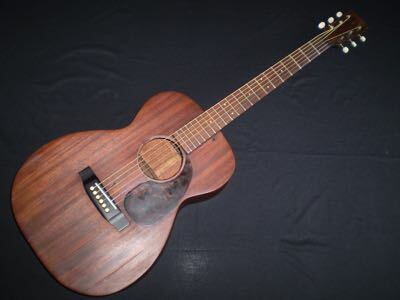 SOLD This is an all Mahogany, 00 size guitar, the model famously played by Bob Dylan. Tonally it has a rich, deep tone, very resonant with a surprisingly full sound when strummed, and great sustain and single note clarity when fingerpicked. The neck feels very comfortable with a gentle V profile. The guitar is in good, refinished condition, with a couple of crack repairs. It must have once had tone and volume controls mounted on the top, as two plugs are visible, but have been done so well you don’t notice them until you really look hard. It has the kind of tone, feel and character that you can only find in a guitar that's been played for 70 plus years. 0017’s from this era tend to go for in excess if £4000, so this is a much more affordable example. It comes in a vintage, but non original hard case. SOLD It’s rare to find a Martin guitar from the 20’s, let alone one under £3000. The 5-17 is an all Mahogany guitar, sized somewhere between a parlour and an 0. It feels as light as a feather, yet the volume it produces is quite surprising. The 12 fret join gives greater resonance, making it a really versatile instrument. Clearly at home with fingerstyle and flat picking, it even strums well. As a 91 year old guitar, you might be nervous to play it live, but it feels strong enough to go for another 91. The neck feels very comfortable with a gentle V profile, and really is a fingerpicker's dream. It has three repairs - a back patch, a neck repair, and a side crack repair - all done professionally - I've had my luthier check them out, and the repairs are strong. The guitar comes in a non original, but very cool vintage hard case. 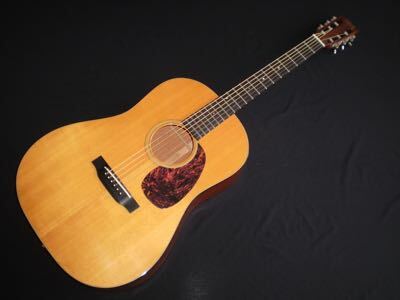 SOLD A lot of people consider the Martin D28 to be the benchmark Spruce / Rosewood dreadnought - well the D41 is even better, a deluxe version made with higher grade tonewoods and only by the top Martin luthiers, with the very distinctive abalone binding and inlays. 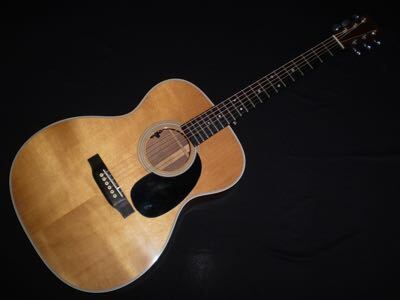 This guitar is a fine example - 29 years old and aged beautifully in sound and appearance. Tonally it has a very complex sound, great depth and resonance, plenty of punch and attack, and well balanced with superbly articulated clarity. 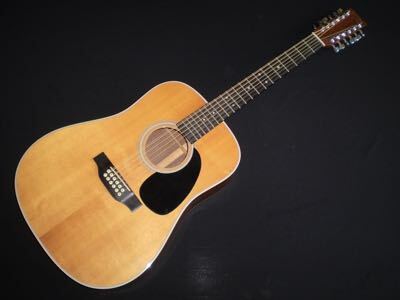 Dreadnoughts are considered to be the most versatile acoustic guitars, and this example sounds great strummed, flatpicked or fingerpicked, and has great definition and sustain when soloing. Quite simply it's a classic. Visually the Spruce top has matured to a golden honey colour and the Indian Rosewood back and sides are dark and beautifully grained. 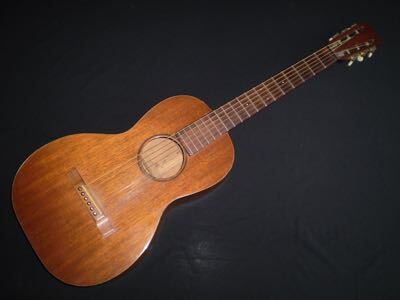 The guitar is in excellent condition, all original, with just a few light dings, and there are no cracks or repairs. From a playability point of view, this guitar is a treat, the neck has a great feel to it, and the action is just right. It comes in it's original Martin hard case.